The Mulva Library is the latest on a long list of places Mary has worked at St. Norbert College. 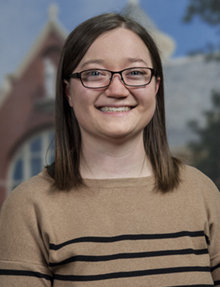 As a student, she worked as an assistant at the Digital Print Center, as a consultant in the Writing Center, and as the assistant to the English department, besides filling in at the Mail Center during the summer. After graduating in May of 2017 with a B.A. in English (creative writing emphasis) and minors in communications and classics, she spent six weeks in New York City attending the Columbia Publishing Course at Columbia University. Returning to De Pere, she found her way back to SNC in fall of 2017. In her role as library services associate, Mary’s primary role is to assist patrons with any needs they have while visiting the library. She enjoys connecting with patrons and solving whatever problems they bring her way. Mary supervises the evening operations of the library Monday through Thursday. Mary loves a good story and gets her fix wherever and however she can – from books, graphic novels, TV shows, movies, plays, and musicals alike. In her free time, when she is not reading books off her never-ending TBR list, imagining stories to write, or binge-watching a new TV show, Mary can be found singing along to the Broadway Anastasia soundtrack, solving the puzzle on Wheel of Fortune, or besting her family at Uno.